Quebec City is the perfect destination for those who want to experience European flair without leaving home too far behind. With a French-speaking culture and old-world architecture, this metropolitan area is a cultural destination that shouldn't be missed. Old Quebec City is a UNESCO World Heritage Site, with a decidedly European appeal. The area has more than 100 restaurants to delight culinary travelers, including many sidewalk cafes and bistros. Visitors will also want to explore one of the major Quebec City attractions, La Citadelle, a major fortress that took more than 30 years to build and features changing of the guard ceremonies in the summer. Flights to Quebec City land at Quebec City Jean Lesage International Airport. 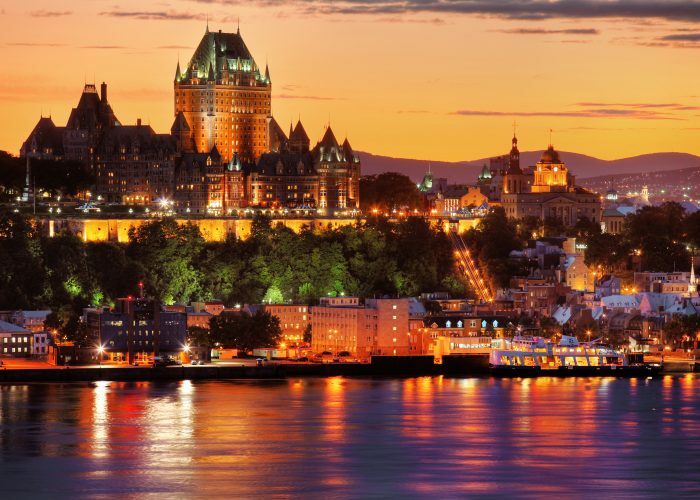 Located on the banks of the St. Lawrence River, Quebec City is a year-round vacation destination. The summer is the most popular time to visit because of sunny weather and school vacations. Many people also visit in the off-season for the Winter Carnival and a variety of snow sports such as cross-country skiing and snowshoeing on the Plains of Abraham. Fall brings colorful foliage and outdoor recreational activities in the nearby forests. Spring sees mild and wet weather, but March and April are peak months for maple sugaring (when the sugar shacks boil the sap and transform it into syrup and treats). Quebec City experiences four distinct seasons. Summer can be warm, especially in July and August. Fall brings pleasant and cooler weather. Winter can be chilly, even cold, with heavy snow in February and March. Spring brings occasional showers and mild temperatures. The summer tends to be the busiest time to visit. Many festivals also attract large crowds, including the Carnaval de Québec in January and February, the Quebec City Summer Festival in July, and the Quebec City SAQ New France Festival in August. Hotels, restaurants, and most attractions remain open year-round. The least expensive times to visit are in the early spring and late fall, while prices rise in the high season because of an increase in demand. The information and websites listed here were valid at the time of publication, but some details may have changed since that time. Please check directly with the provider for the latest information.